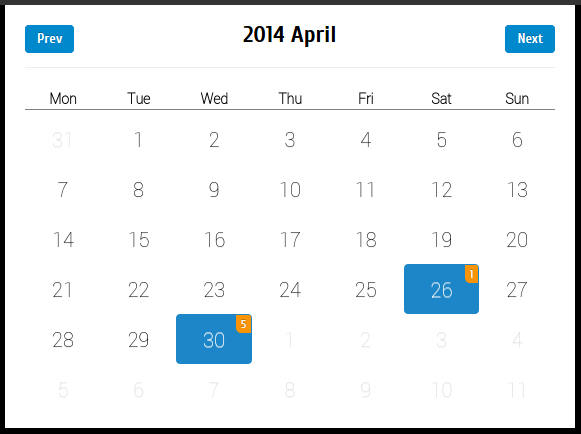 It was hard to find a decent, active, jQuery event calendar plugin that was responsive so I’ve shared my research here. FullCalendar seems to be the default choice for putting an event calendar on a website at the moment – but it isn’t responsive so no good for me. It’s late 2014, time for mobile first folks. Calendario looks very nice (maybe overly styled), the last change on GitHub was six months ago and there are 7 open issues dating back by nearly a year, so I think it is safe to say it isn’t being actively developed at the moment. I finally settled on Responsive Calendar. I think it looks great, it scales down for mobile devices and you can add events once the calendar has been rendered. It also integrates with Twitter Bootstrap. It is free for non commercial use. Published September 10, 2014 . Updated January 19, 2017 . Previous PostPrevious Why would MySQL crash when WordPress attacked? Next PostNext Car Tyres – Worth paying for a better fuel efficiency rating?